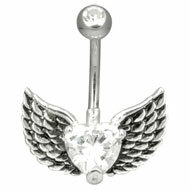 Treat yourself to a glamorous new look with our range of beautiful winged heart piercing jewellery. The winged heart is a classic tattoo symbol and a gorgeous design for piercing jewellery. It looks bright and glamorous, the perfect way to show off your piercings and light up your look. The winged heart symbolises freedom, transformation and love. It combines two popular designs in a graceful yet powerful way and makes for beautiful jewellery. These helix piercing shields are one of our most popular new items and it’s easy to see why. They sparkle with colours jewels and have a beautiful shine that really stands out. Each helix shield consists of a curved piece that fits around the outside of your ear, with a short barbell that goes through your helix piercing and holds it in place. They are made from surgical steel with a bright polish, so they feel comfortable to wear as well as looking stylish. 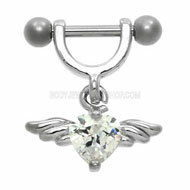 Bright and eye-catching, these winged heart navel piercing bars are a great gift for anyone with a navel piercing. We have a fantastic choice of navel piercing jewellery and these glam designs are a great to update your look. 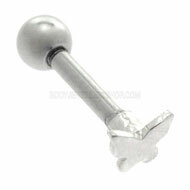 All three belly bars are made from high quality 316L surgical steel, which makes them very comfortable to wear. This entry was posted in Ear Studs and Earrings, Navel Bananabells and tagged Cute Belly Bars, Cute Belly Rings, Helix Piercing Bars, Helix Piercing Shields, Navel Piercing Bars, Navel Piercing Jewellery on January 19, 2013 by Piercing Guru. 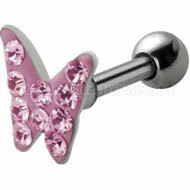 Sweet and summery, butterflies are the perfect motif for gorgeous piercing jewellery. Here at BJS we have a wonderful selection of butterfly piercing jewellery, from simple butterfly earrings to elaborate jewelled pieces. Butterflies are such as easy design to wear and you can style them in lots of different ways. So whether you’re going for sweet and girly or sharp and goth, our butterfly piercing jewellery is a fantastic way to refresh your style. 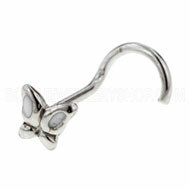 Below are three of my favourite pieces of our butterfly ear piercing jewellery. They are all designed for ear cartilage piercings (tragus and helix) but you could always wear them in your ear lobes too. All three pieces are small are pretty, perfect for adding charming detail to your look. I think a pair of the helix jewellery would look lovely worn as earrings. 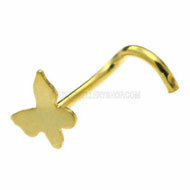 These tiny butterflies are perfect for your nose piercing. They are small enough to be comfortable and not overpowering, but add just the right amount of cute sparkle to your piercing. 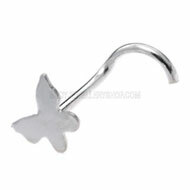 We actually have a large selection of butterfly navel piercing jewellery but here are three of our customer favourites. The pink UV bar and jewelled butterfly perfect for showing off your piercing but personally I love the silver charm bar in the centre. It is simple but very stylish and adds a touch of sophisticated glamour to your piercing and your outfit. This entry was posted in Belly (Navel) Piercings, Ear Piercings, Nose Piercings and tagged Belly Piercing Jewellery, Ear Piercing Jewellery, Navel Piercing Jewellery, Nose Piercings, Piercing Jewellery on June 19, 2012 by Piercing Guru.